It didn’t really hit me that Tomas Kaberle was actually gone until Saturday night when it was evident the Leafs’ blueline was missing a certain slick, steady presence. It was weird watching a Leafs power-play that didn’t employ Kaberle as the quarterback, feeding seemless passes to anxiously awaiting teammates. It’s crazy to think that Brett Ledba, the man Leafs Nation has relentlessly bashed all year, is now the commander of the PP. Gulp. But I’m not complaining. This was a trade that was essential for the Leafs moving forward. Kaberle was Burke’s one true trade chip that many other teams coveted and he wouldn't be back with the club next season. If the Leafs went through another Mats Sundin situation it would make this re-build/re-tool even more arduous than it already is. Plus, it was about time. It seems like the Leafs tried to trade Kaberle since the very moment he re-signed with the club in 2006 (okay, not exactly, but it felt that way), yet they could never manage to actually pull off the deal. Sifting through endless Kaberle rumours every year was wearing down on everybody – including Tomas. Eventually, even the consummate Leaf was ready to move on despite an unhealthy desire to stay amidst the misery. Finally, Burke was able to not only trade Kaberle, but maximize his value as well, getting the Leafs a nice return not many expected. This is even more impressive considering the Leafs were really only dealing with one team (technically). This isn’t to say the Bruins were totally fleeced in this trade. Their team has needed Kaberle for a long time and his acquisition firmly places them among the elite in the Eastern Conference and the NHL. Plus, trading their own first-round pick wasn’t damaging considering scouts regard this as a weak draft class (look at the amount of first-round picks being traded) and they already own the Leafs’ first-round pick which will be a much higher selection. And even though they traded Joe Colborne, their second highest prospect next to Tyler Seguin, they are already flushed with talent at centre and have one of the deeper prospect systems in the league. Over the past two weeks Burke has solidified the Leafs’ rebuilding effort by adding two good prospects formerly taken in the first round in 2008, while adding two first-round picks, a conditional second-round pick, and a third-round selection. Of course the first-round picks will be near the end of the first-round, but it’s a start for a franchise with a history of having no first-round picks. These also give Burke the flexibility to make other deals if he so chooses. 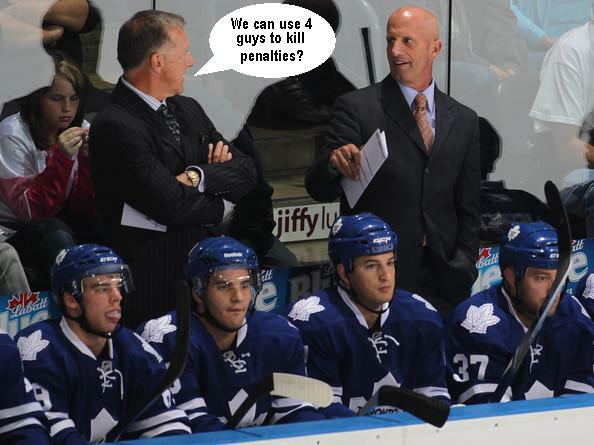 And this is the Leafs we're talking about here, we shouldn't get comfortable with those draft picks. But the Leafs and Bruins completed the trade on Friday and there has been ample time to thoroughly analyze it. What I really wanted to do is to thank Tomas Kaberle for his years of service to the Toronto Maple Leafs and… ummm… apologize for being a part of the angry mob that tried to run him out of town two years running. Brian Burke kicked off the NHL trade frenzy early this year much like he did last season. After the Francois Beauchemin trade was announced there were two more deals. First, the Hawks traded Jake Skille, Hugh Jessiman, and David Pacan for Michael Frolik and Alexander Salak. I don’t want to spend too much time on this deal, but at first blush this is a dumb trade for Florida. It’s never a smart idea to give up on a 22-year-old who already has two 20-goal seasons in his first two years in the league. The second deal brought much more attention – and not just from hockey fans. The Ottawa Senators traded fan favourite Mike Fisher to the Nashville Predators for a first round pick and a conditional pick which could be as high as a second rounder if the Predators win two or more playoff series. 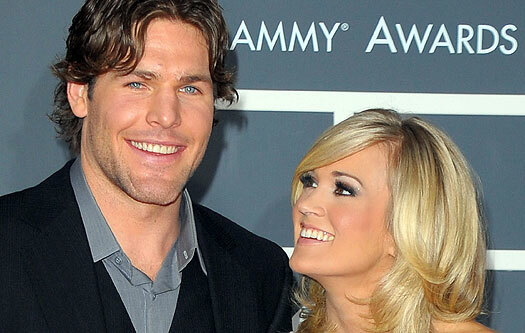 The headline in Nashville’s Tennessean newspaper announced that the Preds acquired “Carrie Underwood’s Husband”. Whatever you have to do to bring the fans to the rink I guess. Senators fans are probably sad to see one of their favourites leave, but they’re getting a first round pick for a 30-year-old player who has only once topped 50 points and is in the midst of his worst statistical season. Be happy because he’s overpaid too. Sure he'll bring a ton of intangibles to the Predators who are suddenly desperate for a centre after a rash of injuries, but first round picks are a valuable thing (don’t tell Burke) and to get one for Fisher is amazing. Predators general manager David Poile made a lot of statements about Fisher, some of which were pure fiction. Note: Poile did not make all of these statements, but I imagine those who love Fisher have at some point, so I added them. I'll remember you for this and not the egregious giveaways. Brian Burke doesn’t like waiting for the NHL trade deadline. Last year he made a major splash on January 31st, acquiring Dion Phaneuf, Keith Aulie, and J.S. Giguere (uh, and I guess Fredrik Sjostrom). This year he made another deal, albeit less significant. Gone is the much maligned Francois Beauchemin. 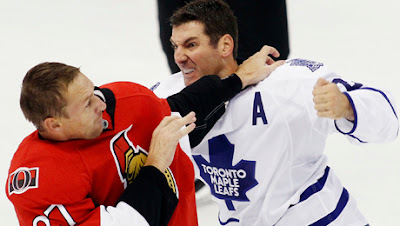 In his place is Joffrey Lupul, probably best known for being traded for Chris Pronger on two separate occasions. 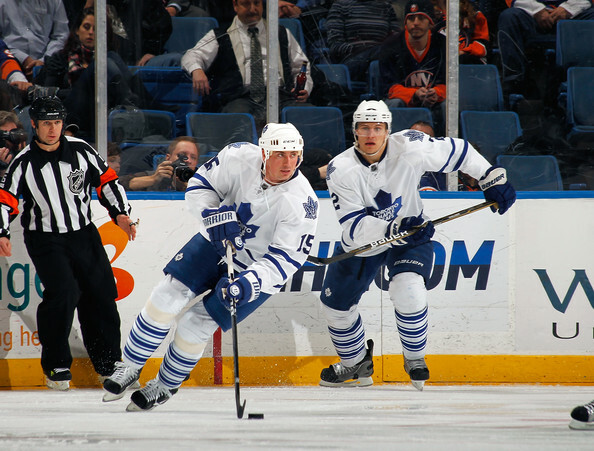 The Leafs also get former first round pick Jake Gardiner and a conditional fourth round pick. According to Pierre LeBrun, the pick is a fourth rounder if Lupul plays 40 games for the Leafs next season, if not, it becomes a sixth round pick. This is a pretty good trade for both the Anaheim Ducks and the Toronto Maple Leafs. Seasonal Affective Disorder (SAD), also known as Winter Depression, is a mood disorder where people who enjoy normal mental health for most of the year break down during the winter months and suffer from depressive symptoms. It’s believed to be related to a lack of light. Just imagine yourself living in the dead of winter in Edmonton, waking up in the dark, going to work all day and coming home in the dark. You’d take up meth too. 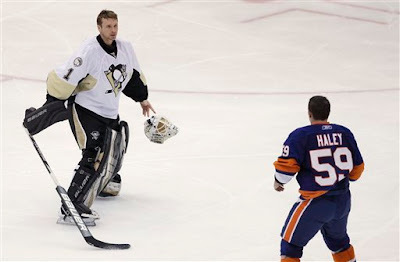 And people get mad at Chris Pronger for demanding out. There’s a little known strain of SAD which has a similar onset and produces the same depressive symptoms. This strain is known as Maple Leafs Syndrome (MLS) and begins in late November and early December. Early onset has been known to occur even earlier - sometimes as early as October 1st. Its inception coincides with mounting losses in the stats column, a lack of first round picks, and a dearth of talent. A well-known treatment for SAD-MLS is copious amounts of booze. Unfortunately, it’s only Tuesday night and I’m sort of a semi-productive member of society. So if you’re feeling blue about the blue and white then you might want to read the following points. Sometimes finding a glimmer of hope is all that can keep you going. As you might imagine, this was a very hard list to compile. So sometimes the points aren't so hopeful. Take a shot if you feel sad.